Not much choice here. If we want to be in Prague for the party, we simply have to head straight there and hope our car doesn't fail us this early in the journey. This should also be the easiest part of the trip. 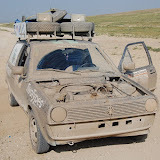 Good roads, familiar terrain, no need for visas and even if the car goes up in flames we'll be back home for dinner. Where to go from Prague? Quite a few possible choices here. For now we've decided to follow Central Route 1, through Slovakia, Hungary and Romania. This will be the first unfamiliar terrain on the journey and by the end we'll have put more than 2000 km behind us. Still, we won't even have left the EU at this point and things shouldn't be too tough. This is were things get a little more interesting. From here on out we'll need visas and Moldova is actually the first country on the list for which the German Foreign Office has some warnings. Nothing serious, but we'll have to avoid Transnistria (a part of Moldova that has declared independence, but isn't internationally recognized). Transnistria is not particularly unsafe, but its unclear status would probably make crossing borders difficult. The really interesting part. The list of advice from the Foreign Office is a lot longer for these countries, but there are rewards to be had. We'll be on the old Silk Road here and come across Samarkand, once at the very center of the Silk Road and the greatest city in Central Asia, now a UNESCO world heritage site. Still, we'll need to do more research before we fully commit to go this way. This may seem like the final stretch of the route, but it's actually about 6500km long and should prove the ultimate test for us and our car. That is, if we even get this far. 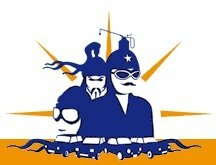 We're still wondering why the suggested routes on the Mongol Rally homepage are so keen on avoiding China. Again, more research is needed. The list obviously subject to change, but for now this is what we're working with. 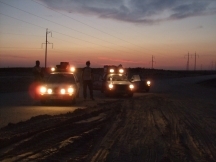 This is it, the official Mongol Rally 2007 Team Blog of Ze Germans. Right now we have no car, no plan and no tea. We do have some pocket fluff, however, and we're working on the rest.